What happened to the 20's. I'm grown for real now! Time surely does fly. This is from my 30th birthday dinner. Shout out to all my Piscean brothers and sisters. I asked the same question when I hit 40. The 30's were a blur. 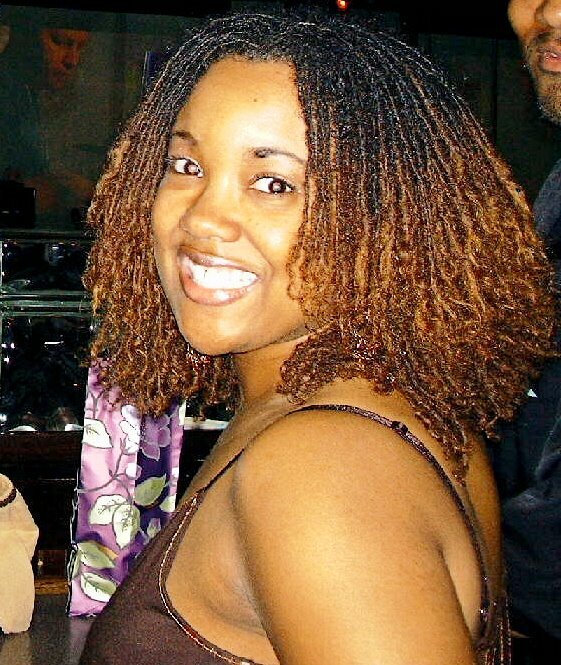 Your locs are simply stunning daaahling! 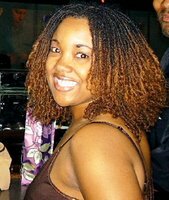 Love your blog and your Sisterlocks! I think the thirties are when things start crack-a-lackin'. The only thing I miss about my twenties is my waistline! I just want to say that your hair is absolutely stunning! It is wonderful to see the different stages of your hair. It went from microbraids to a little dull loc look and then with this last picture, a complete explosion of beautiful healthy shiny locs. I was just wondering if you had any shrinkage because mine has retreated to about 5 inches from 10 to 11 inches. Also, just looking at the coloring, it seems that your hair went into supergrow mode. If you hadn't colored your hair since March 21, 2005 and the most recent picture is reflecting the new growth since that color was put in, I need to do what you are doing, lol! WOW! Your locks are RED HOT! LOVE IT! They are gorgeous.... and a great look for you! love the blog! I will be back to visit! Thank you all for the wonderful compliments! I'm enjoying reading all the blogs also. I have had some shrinkage in the back but it's starting to act "normal" again...lol. Happy Birthday! (I don't say belated, because if you're like me you celebrate for the whole month!) And the 30s are pretty fabulous if I say so myself! Okay now, two words: LOC ENVY!!! Your locks are gorgeous!!!!! Wow!! Breathtaking. Thanks for sharing! Thanks for blogging, I have a similar color, and now I can see what it can potentially look like as it grows out - FAB! Please provide your maintenence stats! How often do you retighten? Who does it, sisterlocks tool? Lemme just say, I found some more inspiration!!! Those are some georgeous locks GURL!!!!! First let me say thanks for the compliment. I wash it every week with black soap. I am finally at the stage where I can take a shower without the cap! I get it retightened between 5-6 weeks. I just recently started going to a new consultant (Dee) here in Atlanta and she uses the Sisterlock tool. Your locks are beautiful!! Love the color. WOW WOW WOW!!!! Girl you just knocked my socks off with those pics. I had seen your album on Lockitup with the pics from your first SL color and thought how cute your hair looked then....but honey that has nothing on now (lol). I love it! WOW WOW WOW - I'm speechless. your hair is simply beautiful. 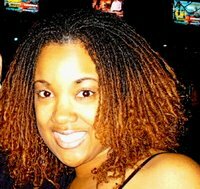 i have a cousin in hotlanta who also has sisterlocks.